Posted: Friday 31st October 2014 in Paid Media, Thought Leadership. 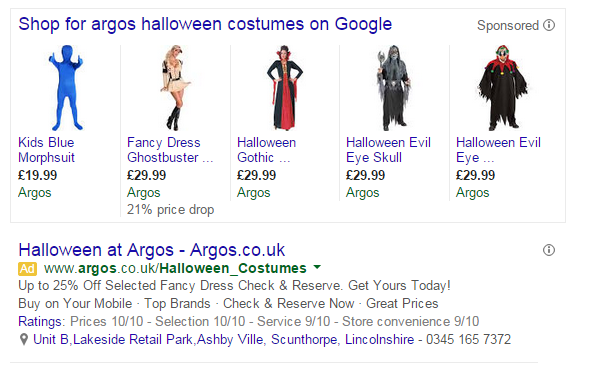 Google Price Drop Annotations are a new Shopping feature that has been recently launched by Google. The PLA-only feature reviews the last 90 days of feed uploads to create specific price drop detail that is shown on the SERP for the advertised PLAs. Retailers are automatically opted in so it is worth while keeping an eye out for them as they appear amongst your shopping results, and whilst you’re browsing over Christmas to help identify a bargain. The new annotations can appear across all devices, but is worth noting that normal auction dynamics apply. Why is it important for retailers? Google has not made any statistics available as yet. However, with consumers being able to easily identify when a retailer is actively reducing prices, we expect this to have a positive impact on both CTR (click through rate) and CR (Conversion Rate). Increasing ROI retailers can achieve through Google Shopping. Regular feed maintenance is essential to ensure price accuracy is maintained. The quality of your feed will have an impact on annotations your PLA deliver and ultimately implementation of the feature. As this is an auto enrolment feature that Google has developed, we would recommend that you contact your Google account manager to discuss any questions that are specific to your brand. If you wish to opt out, again, you should contact your Google account manager or representative. If you’ve got a question about Google shopping or our feed enrichment service we’d be more than happy to answer it. Contact Dan Upson, Head of Shopping.